For all of you looking to get in one more outdoor festival before the summer is over, we have a great one for you. Labor Day weekend the Hamtramck Labor Day festival will take place. 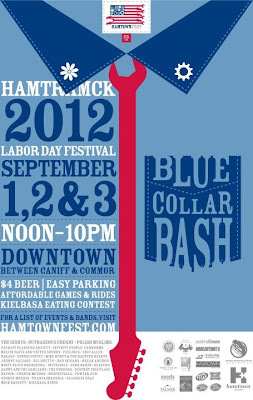 The festival is a 3 day event occurring in Hamtramck the 1st, 2nd and 3rd of September. It features a parade, boat races, rides, a 5K run and cheap beer. The festival begins at 12pm and goes till 10 pm each day. There are ton of great bands playing all weekend long. Saturday features Phantasmagoria playing at 8:30 p.m. Sunday features Mick Basset at 7:30 p.m. and The Sights at 8:30 p.m. Monday (the main day) features Break Anchor at 6:30 p.m., Deastro at 7 p.m. (on the south stage) and Destroy This Place at 7:30 p.m. These are all bands that we enjoy and love to see play live. For a full list of other acts that are preforming go here. The parade takes place on Monday and is followed up immediately at 1:30 p.m. with a Kielbasa eating contest that has a $350 cash prize for the winner. Sometimes all you need is a great big kielbasa to have a great day. The boat races are not like the races that you would normally see. Since it takes place in a city with no water, the Yacht Club Canoe Races occur right down the streets of Hamtramck for everyone to watch and cheer. This festival is an annual event for the city and brings many people down for the weekend. We are excited to see some great Detroit music outside and for free. We look forward to celebrating the end of summer and the beginning of the best time of year, fall, with all of you!